For some young children, bath time is anything but fun. The good news is, it doesn’t need to be that way. 1. Don’t encourage your child’s fear of getting water in their eyes. Leave the bath visors at home and encourage your child to splash himself gently in the face. Gently pour water over his head or use the shower nozzle to rinse his hair. Better yet, let him do it. You may end up a little wet, but chances are, he’ll end up with a new fascination with water. 2. Get some Magic Capsules. Since many bath toys are breeding grounds for bacteria, consider using Magic Capsules that can be tossed out after each use. Magic Capsules are mini sponges that come in the shapes of animals and are stuffed into a gel like capsule. Once they’re put into the warm bath, the capsule dissolves and the sponge expands into a creature of its own. 3. Bring in a baby. Let your child bring in his or her baby doll and give it a bath. If you’d like your son to have a doll that really looks like him, consider an anatomically correct one. 4. Use homemade soap crayons. Let your child color as he gets clean with homemade soap crayons. The great this is the mess just rinses away. While many parents fill the tub with bubbles and toys, keeping bath fast and fun is usually your best bet. What bath time tips can you share? 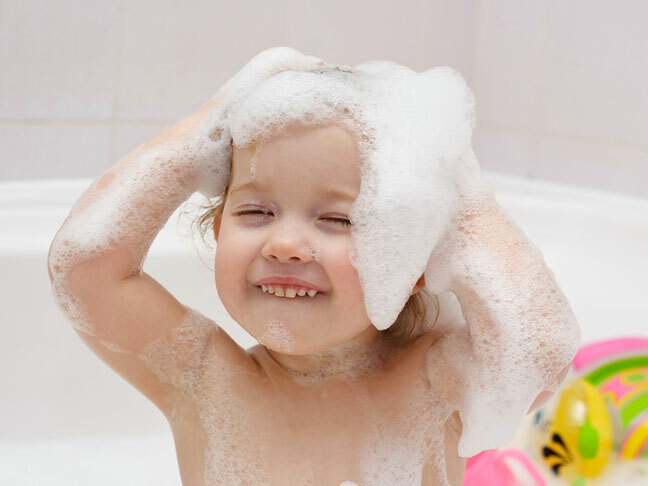 How does your child have fun in the bath?